NREL is one of the more significant organizations in the Denver area that you probably know little--if anything--about. Including construction jobs, NREL employs 2,500-2,600 people and, according to the Leeds School of Business at CU, had an $831.3 million dollar economic benefit to Colorado in FY2011--especially metro Denver. Come to City Club of Denver to learn about clean energy technology development being done in your own back yard. Dr. Dan Arvizu, Director and Chief Executive of NREL, will discuss the significant progress being made at the National Renewable Energy Laboratory, located in Golden, to meet our energy needs in an ever-changing environment. He will present a systems-level perspective that encourages investments in truly game-changing, thought-provoking technologies. In the end, energy transformation will be achieved when we invent the future we desire, invest in innovation, improve access to capital, and partner on a global scale. Dan E. Arvizu became the eighth Director of the U.S. Department of Energy's National Renewable Energy Laboratory (NREL) on January 15, 2005. NREL, located in Golden, Colorado, is the Department of Energy's primary laboratory for energy efficiency and renewable energy research and development. NREL is operated for DOE by Alliance for Sustainable Energy, LLC (Alliance). Dr. Arvizu is President of Alliance and also is an Executive Vice President with the Midwest Research Institute, headquartered in Kansas City, Missouri. 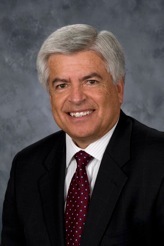 Prior to joining NREL, Dr. Arvizu was the chief technology officer with CH2M HILL Companies, Ltd. Before joining CH2M he was an executive with Sandia National Laboratories in Albuquerque, New Mexico. He started his career and spent four years at the AT&T Bell Telephone Laboratories. In 2011, Dr. Arvizu was appointed by the President for a five-year term on the National Science Board, the governing board of the National Science Foundation and the national science policy advisory body to the President and the Congress. Dr. Arvizu serves on a number of Boards, Panels and Advisory Committees including the American Council on Renewable Energy Advisory Board, the Singapore Energy International Advisory Panel, the Great Minds in STEM Board of Directors, the Colorado Renewable Energy Authority Board of Directors, the Stanford Precourt Institute for Energy Advisory Council, and is Fellow of the National Academy of Public Administration. He has a Bachelors of Science in Mechanical Engineering from New Mexico State University and a Master of Science and Ph.D. in Mechanical Engineering from Stanford University.